What’s responsible for the worldwide epidemic of type 2 diabetes? And a major cause of the metabolic syndrome, obesity, and other health problems? Increasingly, evidence points to a rise in our sugar intake. Not just sugar, but one component of sugar. What we call sugar (table sugar, extracted from sugarcane or sugar beets), is known chemically as sucrose. It’s composed of equal parts of two simple sugars—fructose and glucose—joined chemically. 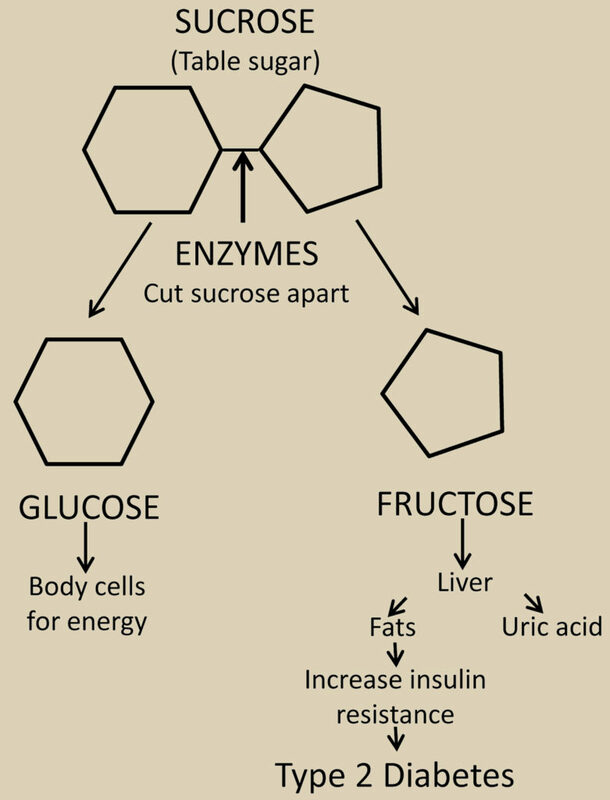 Enzymes in the small intestine break sucrose apart. The blood carries glucose to the body cells, and fructose to the liver. The body cells use glucose, the sugar normally present in blood, as their energy source. But the liver converts fructose to uric acid and fats. Uric acid alters the metabolism, and can cause gout; fats increase insulin resistance. In ancient times, before the advent of sugar, type 2 diabetes was extremely rare. But a few centuries ago as people began to consume sugar in increasing amounts, the incidence of diabetes also began increasing. In the last 50 or so years, now that sugar has become widely popular, and sugar-sweetened beverages and other sweets are widely used, the world has come down with what amounts to an epidemic of diabetes. This epidemic corresponds to the widespread consumption of sugar-sweetened beverages, such as soft drinks, and to a lesser extent use of sugar in baked goods and other sweets. High-fructose corn syrup (HFCS) contains roughly equal amounts of fructose and glucose. The two simple sugars are not joined chemically, as they are in table sugar. HFCS is used extensively in sugar-sweetened beverages and commercially prepared foods. But because it contains roughly as much fructose as table sugar does, HFCS affects our bodies in the same way as sucrose. It’s a small step. But making a small change now could mean a big difference health wise down the road.